The drill floor is where the lengths of drill pipe are assembled and dropped down to the sea floor. They pass through the floor below which holds this feature, the moonpool. It is a large circular hole that passes through the centre of the ship. The pale turquoise colour in the photo is the open sea beneath the ship. The moonpool has a metal cover that can be pulled back (as here) to allow larger pieces of kit attached to the drill pipe to be sent down e.g. the camera assembly, or the 12 foot diameter re-entry cone sent down to the sea floor to guide subsequent drilling operations to the right spot. 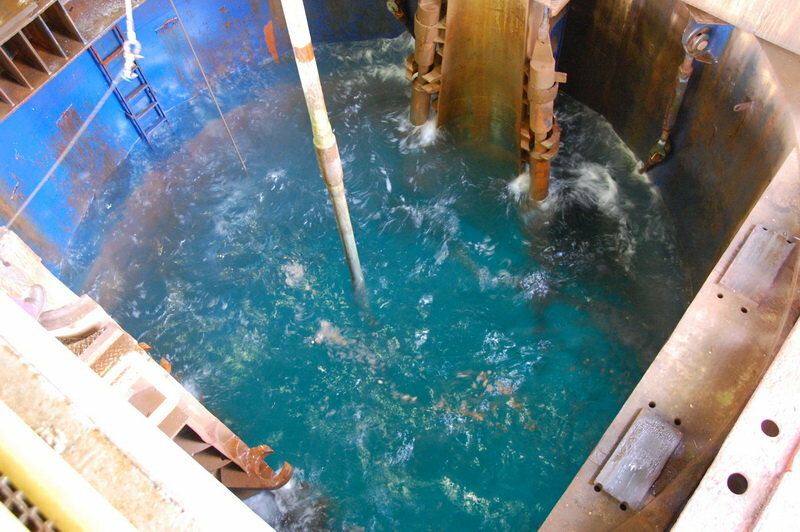 We never tire of watching equipment descend through the moonpool or be pulled back off the seafloor through it.